This document contains design drawings for a 30m3 circular water reservoir constructed from bricks and reinforced concrete. This document contains design drawings for a 50m3 square water reservoir constructed from reinforced concrete. This document contains design drawings for a 30m3 square water reservoir constructed from reinforced concrete. 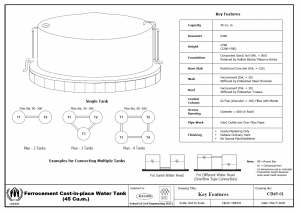 This document contains design drawings for a 10m3 square water reservoir constructed from reinforced concrete. Tags: Camp Closure, camp management, Child Friendly Facilities, Cold Climates, Disability, Environment, Gender, Gender Based Violence, Human Right to Water / Sanitation, Protection, Value for Money, WASH Coordination, WASH Monitoring, WASH Programme Health and Safety, and WASH Reporting. Categories: WASH Manual. This document contains design drawings for a 90m3 circular water reservoir constructed from ferrocement. This document contains design drawings for a 75m3 circular water reservoir constructed from ferrocement. This document contains design drawings for a 45m3 circular water reservoir constructed from ferrocement. 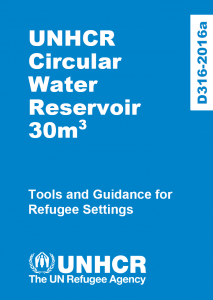 Tags: Piped Water Networks, Piped Water Networks, Piped Water Networks, Piped Water Networks, Piped Water Networks, Piped Water Networks, Piped Water Networks, Water Storage, Water Storage, Water Storage, Water Storage, Water Storage, Water Storage, Water Storage, Water Supply, Water Supply, Water Supply, Water Supply, Water Supply, Water Supply, and Water Supply. Categories: WASH Reference Documents, WASH Reference Documents, WASH Reference Documents, WASH Reference Documents, WASH Reference Documents, WASH Reference Documents, WASH Technical Designs, WASH Technical Designs, WASH Technical Designs, WASH Technical Designs, WASH Technical Designs, WASH Technical Designs, and WASH Technical Designs. This report is based on a desk-based review of secondary data, comprising published material as well as grey literature, supplemented with key informant interviews for programmes that lacked documentation. 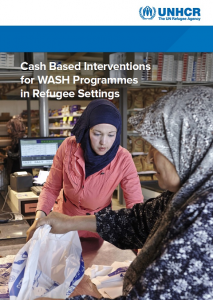 Section One summarises the current use of CBI in WASH programming. Section Two summarises the best practices and lessons learned including challenges faced, drawing on evidence from the project examples found. Section Three provides recommendations and best practice guidance for use of CBI in refugee settings. Section Four details existing tools and guidance. Tags: Capacity Building, Capacity Building, CASH Interventions, CASH Interventions, Cross Cutting, Cross Cutting, WASH Assessments, WASH Assessments, WASH Programme Management, WASH Programme Management, WASH Strategy Development, and WASH Strategy Development. Languages: English, English, English, English, English, English, English, English, and English. Organisations: UNHCR, UNHCR, UNHCR, UNHCR, UNHCR, UNHCR, UNHCR, UNHCR, and UNHCR. 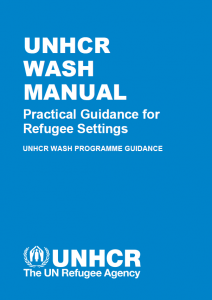 Categories: WASH Guidelines, WASH Operational Guidelines, WASH Operational Guidelines, WASH Policy Guidelines, WASH Policy Guidelines, WASH Research Documents, WASH Research Documents, and WASH Research Documents.